Pig Mama and Baby…almost finished. I started sketching this mama pig and her baby the other day. The mama pig’s eyes are completely closed, so it may look funny when I finish. The photo is from a very nice gift my daughter bought for me a couple of months ago. The gift is a book called “The Wisdom of Moms…Love and Lessons From the Animal Kingdom” by Bridget E. Hamilton. She thought I would like to draw the animals; they are all beautiful. My daughter was sad that there were not any turtles in the book, but when I received it from her in the mail while she was gone this summer, I probably don’t have to tell you how much I cried. Just knowing she thought of me when she found it was a gift in itself. The quote on the next page for this photo says “Love the moment, and the energy of that moment will spread beyond all boundaries.” Sister Corita Kent. This is so true! Learning to live in the present has always been a challenge for me. I used to preoccupy my thoughts with things I was dealing with from the past or worrying about the future, but I do very little of that anymore. The present is beautiful in itself! At the bottom of the page where this quote is, it says, “Free-range farm pigs will make a nest for their families, gathering straw for warmth when the piglets are young.” The photo shows them laying in some straw. This is going to be very challenging to do in pencil! I love all animals in the book, and I still can’t tell you why when I was a teenager I began to love turtles so much, but as I have said before I love sea turtles now, because they are so beautiful, graceful, and endangered. For my fourth assignment for my writing class I am working on gathering current information about sea turtles, picking the most endangered type, and writing about conservation. I think this assignment is going to take a while…just doing the research will take quite a bit of time. In the meantime, another project I am going to have to start soon is working on a painting of our dog for an auction on eBay to benefit “Forever Foster Homes” and the “Old Friends Senior Dog Sanctuary.” Their notice said they are “currently providing lifetime care for over 300 senior dogs.” My daughter told me about it a while back. It is not a contest; they are just taking donations of people’s artwork. The deadline for donations is November 1st! The auction starts the second week of November. So as usual I have my work cut out for me. I also want to write a piece to send into “Chicken Soup for the Soul” which would be my first real writing submission anywhere. It has to be a true story. I may have told you all about it already. There is no deadline for this, though. However, the institute where I am taking my class is having a poetry contest. The poem has to be about an animal, but I really don’t write a lot of poetry, so I’m not sure I’m going to have time to submit anything. Also, the deadline for that is November 5th! Whew! Lots of opportunities but I need to choose wisely. I hope everyone will enjoy your October, the beginning of fall, and Halloween if you celebrate it. I hope to make a few more posts this month, but my creative life has gotten pretty busy these days! 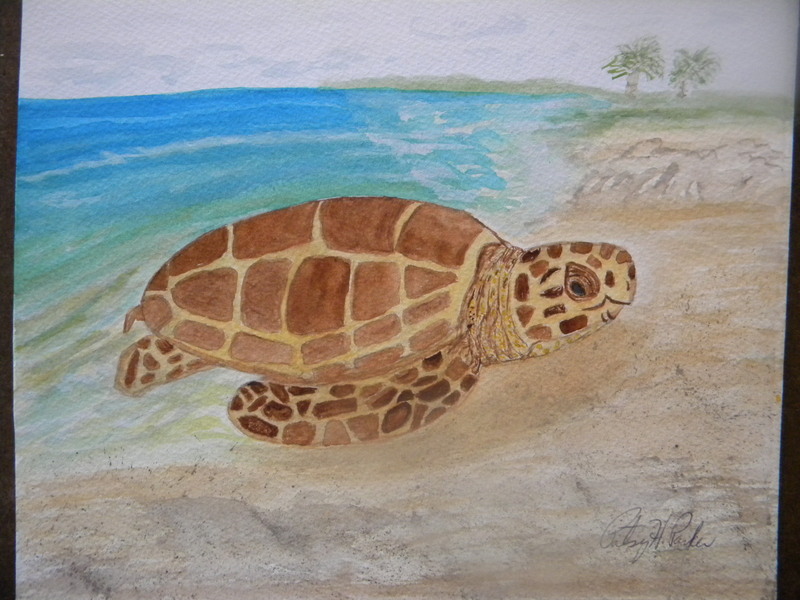 I am hoping to get the first couple of 5×7 paintings of my sea turtles I did to a printer this month also! Let me tell you what. Being a turtle mommy, for me at least, has been like winning free tickets to the “learning curve rollercoaster” – that really fast, scary one I never wanted to ride in the first place. If you’ve been following Malti’s adventures here and on social media, you probably remember that she recently went missing for 6 days. Those were pretty much the 6 longest days of our life together to date. Malti sitting securely in her mommy’s lap immediately post-rescue. In our personal network, no one seemed surprised that I would ditch work, socializing and pretty much everything else for 6 consecutive days to search for my baby turtle. This tortoise is one of the largest in the world. It can live up to 150 years in the wild and longer in captivity. You can read more about them here: https://en.wikipedia.org/wiki/Aldabra_giant_tortoise I just don’t have the energy to write much more about them right now. 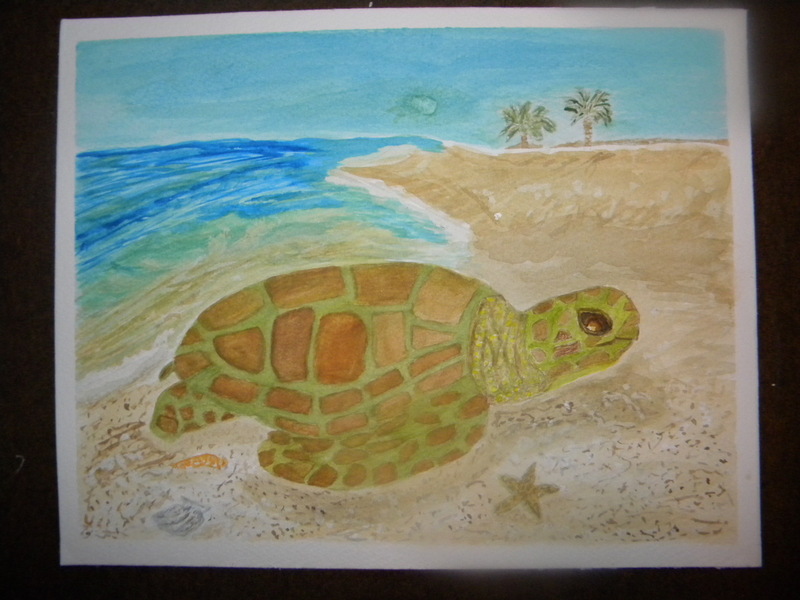 I tried to paint my Australian Flatback sea turtle in watercolors the other day, but the colors came out horrible!! So I will have to try again. I think when I don’t feel very well, I can’t concentrate on what I really want to do. I turned in my third writing assignment to my online class. I haven’t heard back from my instructor yet, but I just turned it in Friday night…after hours. Things have been slow moving around home in the last few days but always good. My husband is away until Wednesday, but my daughter is here, which I am very glad about! Here is a very different looking kind of tortoise! This was really a challenge to draw in graphite pencil. I have been working on it for about a week a little each day. They live in Madagascar, are endangered, and can live as long as 188 years! You can read more about the Radiated Tortoise here: https://en.wikipedia.org/wiki/Radiated_tortoise. They are beautiful! 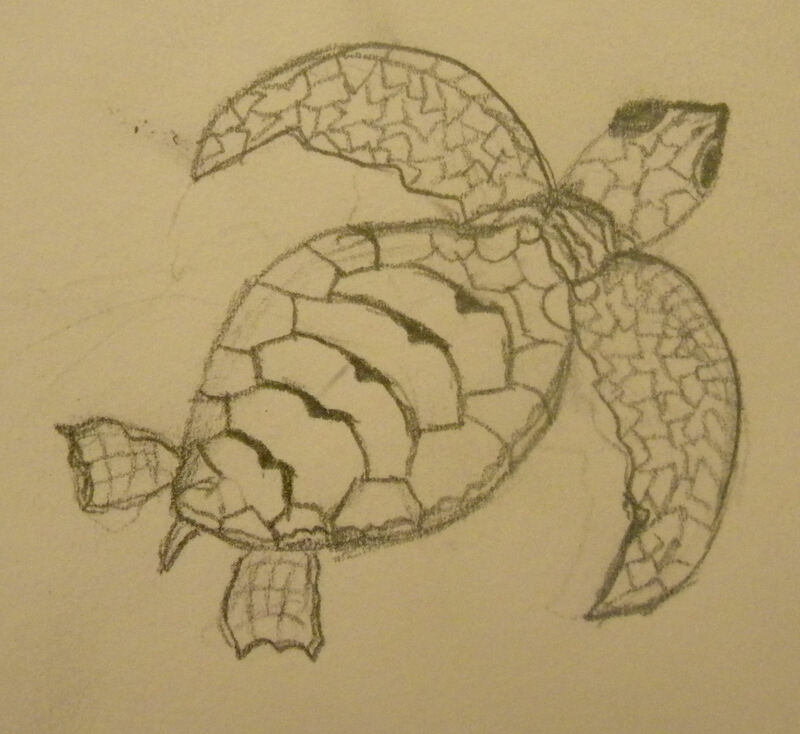 I was working from a children’s picture book called “Turtles” A TRUE BOOK by Trudi Strain Trueit. I found it at the library. It was published in 2003. The photograph I drew this from was taken by Paul J. Fusco. There are many other different types of turtles and tortoises in this book, so I may draw a few more. There is one I plan to try and paint when I am feeling better. It is a spotted pond turtle. I have been fighting a sore throat since last night so my energy level is pretty low right now. I usually get one this time of year when the weather changes suddenly. We have had really hot weather all summer, then this past week, the temperatures plunged about 40 degrees! It is crazy weather here this time of year. However, the cooler weather is kinder to the arthritis in my feet so that’s good! I just pray I never get it in my hands. I have spent most of the last couple of weeks working on a story for my third assignment in my writing correspondence class. And of course I have been reading a lot. I finished Stephen King’s book “On Writing.” I really love his sense of humor and style of writing about his life and craft. I am going to be finishing his novel “Misery” soon which has been quite entertaining. I have seen the movie several times which I think is different in some ways, but I still am hearing Kathy Bates’ and James Caan’s voices in my head which has been fun. I hope all of my blogging friends are doing well. Box Turtle – Don’t Bug Me!! I checked out some cool turtle books from the library a week or so ago. 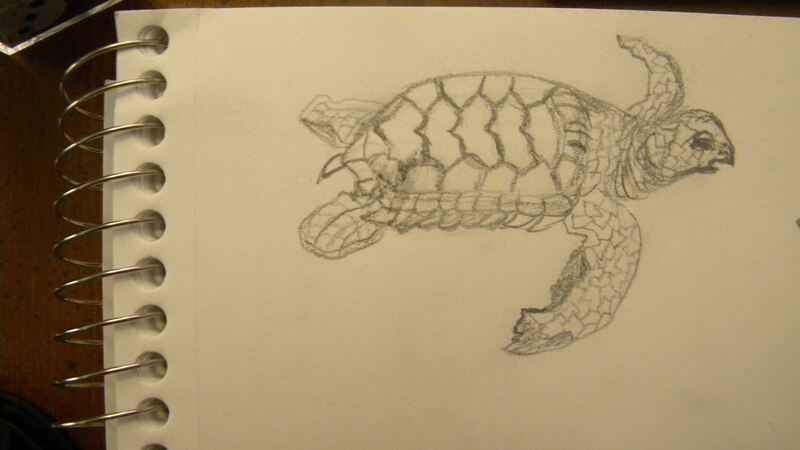 So I have been working on this box turtle from a book called “Turtles” by Deborah Dennard. It is in the “Our Wild World Series” of books. I just loved the way this turtle was all closed up when the photographer took the picture. 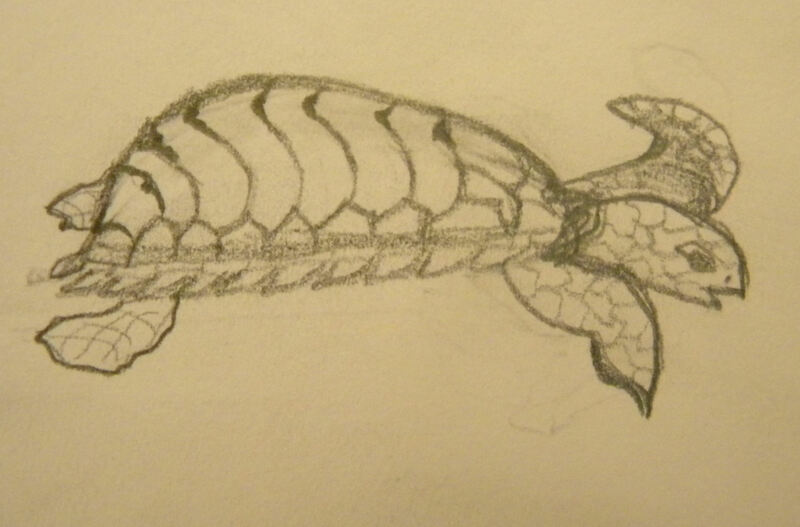 I did not trace this one but drew it by sight so it isn’t an exact rendering. However, it has taken many hours, but I have decided it is finished. I didn’t do the background exactly the same either. So here is a Box Turtle in hiding! There is hardly any of its face showing as you can probably tell. It is just a sliver really. That is why I chose to draw it. They are just so cute even when they are hiding. I have finally written a picture book story and am going to be working on illustrations for it. It is about Leatherback Sea Turtles, but that’s all I’m going to say for now! I found a writing website that takes submissions for short stories, but apparently, if it has been published anywhere else on the internet, they won’t accept it. I have never heard of that, but I also have not tried to get anything published before. HAS ANYONE ELSE HEARD OF THIS? I may post pictures of my latest little sketches of “turtle expressions.” I am loving the online class I have been doing. I am learning how to write, illustrate and publish children’s stories. I love the teacher’s enthusiasm. She is very encouraging. I haven’t posted any of my ideas on there yet, but I plan to. 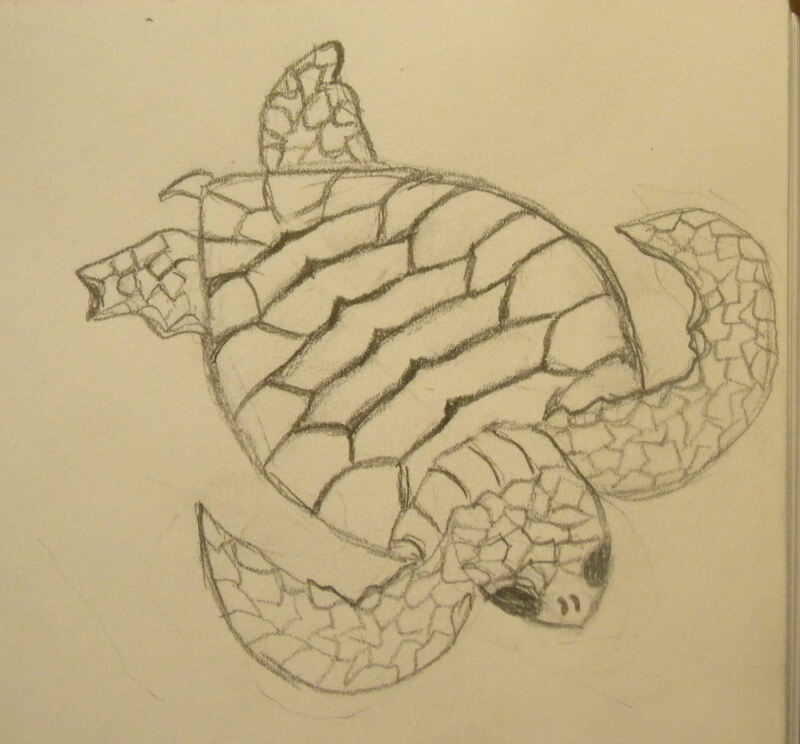 I decided to do Loggerhead hatchlings instead of Olive Ridley hatchlings for this painting. 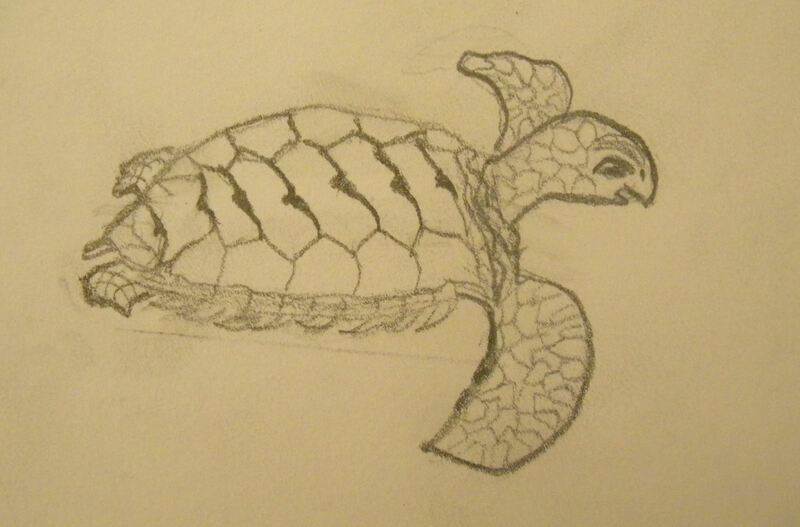 The painting after this one will probably be an Olive Ridley adult or maybe a juvenile. Ahoy! A New Sea Turtle Has Landed!! This is an 8×10 Watercolor I did today. Sea Turtle painted for a friend. My first paid job!